It was a cold, blustery day but I needed more big pots in the greenhouse. Driving the truck over the frozen ground to the pole barn, I watched the horizontal snowflakes bounce off the windshield. My boots crunched through the crust of icy snow as I trudged into the dimness. There was no sunlight today to filter through the translucent panels that served as windows. My gloves were stiff as I picked up the first stack of two-gallon pots and carried them to the truck. I was thinking more of hot chocolate to warm my hands than I was of the task at hand. Bending to lift a stack of three-gallon pots, I heard a clicking sound. Just below my face was the largest opossum I’d ever seen, and she was not happy that I had found her hiding place! Now, I’ve never thought of opossums as attractive. In fact, I think they are positively ugly, especially when they are glaring with their large black eyes and snapping their sharp, pointed teethed aggressively. This one had the usual whitish-gray stiff fur that looks sparse and scruffy. Her long rat-like tail stuck out stiffly behind her as she moved her head from side to side. My hands refused to drop the pots, even though I had been startled. Ridiculously, my brain immediately imagined this huge “rat” running up my pant leg, and I stomped my foot in reflex, backing away out the door. Surprisingly, the opossum curled up into a tight ball, instead of running to find a new hiding place. I placed the pots in the truck, and closed the door to the barn. This was not my first encounter with an opossum. Way back in the early 70’s, my brother-in-law was taking a taxidermy class at Purdue, in preparation for a degree in conservation. He needed to process a certain number of specimens to achieve a good grade. He’s already run a trap-line in and around his dorm, so he had a variety of the usual small animals and rodents, but felt he needed a few more to earn an “A.” So, when I accidentally ran over an opossum coming home from work one evening, I didn’t hesitate to throw the creature into the trunk for Bill’s project. 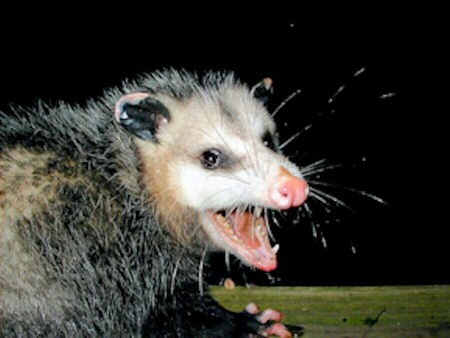 Unfortunately, when I arrived at home and opened the trunk, the opossum had revived and was snapping its teeth in rage. I grabbed a shovel and whacked the “rat” on the head, and it sure looked dead this time. I put it in a box and taped it shut, intending to deliver it to Bill the following morning. Of course, when he opened the box, the opossum was again snapping its teeth. He explained to me that an opossum has one of the strongest skull structures in the animal kingdom, so my shovel whack had only caused the opossum to “play possum.” This animal’s normal response to danger is to roll into a ball and “play dead” until the predator leaves. Opossums are native to the US, from as far west as Iowa to the Atlantic, from New England to Florida and along the southern coast into Mexico. For some reason, people introduced them into Washington, Oregon and northern California where they have become established. Opossums are the only native marsupial in North America, which means they raise their young in a pouch on the abdomen. A female opossum gives birth to 20 babies, so small they would all fit into a teaspoon. They make their way inside the pouch to one of 13 teats. Those that do not attach to a teat die. At about 4 weeks of age, the young sometimes peak over the edge of the pouch. At 5 weeks, they leave the pouch for brief periods as the adult begins to introduce them to foods. By 8 weeks, when they no longer nurse, they leave the pouch entirely. An opossum feeds on nearly anything. Persimmons and eggs are some of their favorite foods, although they will eat small animals, birds, mice, produce, and grain. They will definitely eat dog or cat food if it is available. One spring, I noticed that none of my hollyhocks had reappeared, so I replanted dozens of large plants from the sales area. Later on, as I checked the greenhouse one evening, I discovered a huge opossum calmly munching on the fleshy hollyhock roots. Apparently, they eat hollyhocks all winter, as I’ve since found their star-shaped footprints in the snow beside holes in my flower borders where hollyhocks once grew. Normally an opossum is the size of a cat, although they can reach over 3’ in length and weigh over 15 pounds! Lifespan for this animal is about 8 years. Opossums are active all year, and are most transient at night. They are not tidy, preferring to live in filthy dens or hollow logs. They are excellent tree climbers, and are famous for being able to hang upside down on a limb by their prehensile tail. Since they begin breeding at one year of age, generally have 13 young, and can produce two litters per year, it is no wonder that they are rapidly increasing in population. Personally, I’d rather have hollyhocks as opossums, so I’ve resorted to a live trap.